Whether walking to work on a cold winter’s morning or punching out a university assignment at the 11th hour, hard-edged metal can be a wellspring of motivation. Colouring the bright veneer and new-age feel-goodery of yoga with dark music of Sunn O))), Earth, and Godspeed You! Black Emperor, this particularly unique brand of yoga departs from traditional yoga norms. Drawing deeper from the metal aesthetic, some classes even incorporate black clad instructors and ambient lighting. Stretching out to bleak and unremitting drones might seem novelty, but it’s a way of life for US yoga instructor Kimee Massie. 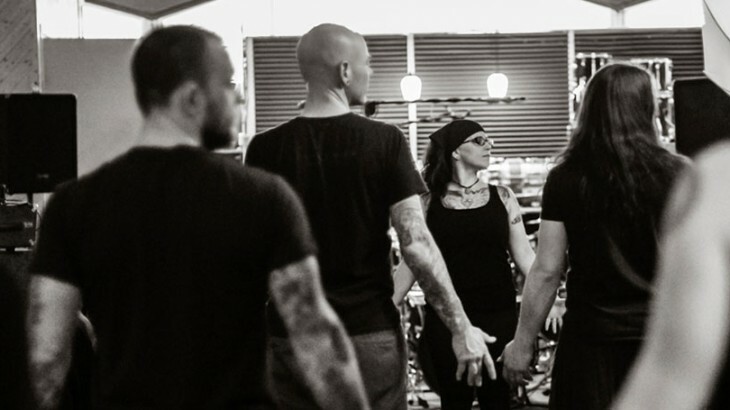 Partner of vocalist of the band Storm King, Massie’s Black Yoga is the largest in a growing number of metal-inspired yoga schools. Massie has also released what a may be a world first, releasing BLACK YO)))GA: Asanas Ritual, Vol. 1 in 2015. A CD-DVD combination, the Black YO))GA combines vinyasa style yoga with “drone, noise, stoner metal, ambient, industrial, space doom, and other traditional meditation music.” The video guides owners through an hour-long black metal yoga session. Recently, Massie opened up to The Guardian on the origins of her take on black metal yoga. “I had been teaching yoga in the regular studios and gyms for a couple of years, and I needed something to play in my classes that that would fit me and my personality (my own record collection is mostly Babes in Toyland and Sepultura). It wasn’t so much about being ‘metal’, that just kind of naturally creeped in there because of who I am and what I’m into,” the mat master explained. Substituting the dark lord for inner peace? Metal has certainly been to crasser and more commercial places, so why not?